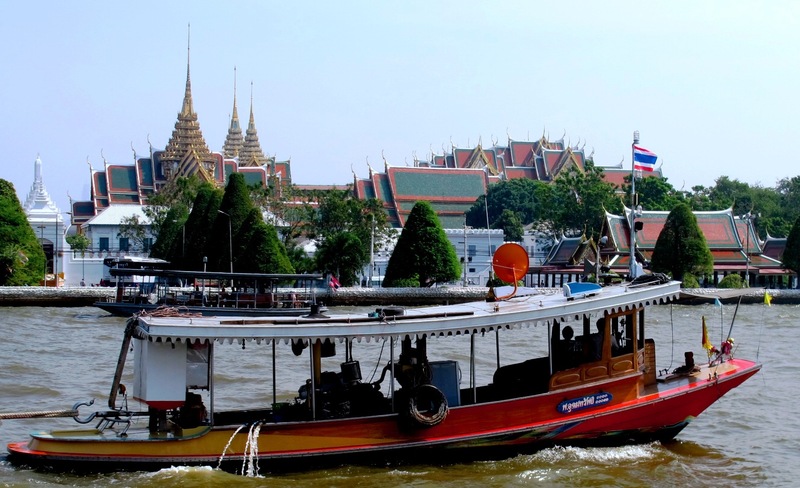 Some of the major visitor attractions in Bangkok are luxury hotels at great prices, glittering Buddhist temples, spectacular palaces, canal scenes, legendary nightlife and some of the best shopping available anywhere. If you forget the heat, the humidity, the traffic and the pollution, this is a truly great city. At the very least, it is a wonderful place to have a good time and sample some of the attractions of an amazing country. In my opinion, the best place to start is the “Royal area”. The Grand Palace and the adjacent Temple of the Emerald Buddha must be on every visitor’s itinerary. This complex rivals the very best European palaces and cathedrals in interest and architectural attraction. From certain angles, this represents all that is best about Thailand and Thai culture. It is a sight guaranteed to impress the most blasé traveler. The huge white walled complex is in the center of ‘historic Bangkok’. The palace was originally built in 1782 by the first king who ruled from Bangkok. Since then almost every other king has added to it so that today the complex is an amazing mixture of architectural styles that somehow work together to create a very impressive feature. The Grand Palace is no longer used as a royal residence but it is used for state functions, the presentation of ambassador credentials and some other ceremonies. The best part of the original palace building is known as the Dusit Group and the Phra Maha Montien Group. The main building is a splendid example of classic Thai architecture with its four-tiered roof and nine-tiered spire. Near the main building is a beautiful pavilion where the king alighted before entering the main audience hall. Please take a close look – it really is exquisite. You can see the reception rooms of what was once a royal residence. The Chakri Group of halls was built by King Chulalongkorn (Rama 5) in 1882 in a style incorporating both Thai and Western architectural elements. The central throne room with its four canvases is a highlight. The Temple of the Emerald Buddha serves as the royal temple. Admission to both the temple and Grand Palace is 250 Baht. Opening hours are 8.30 – 3.30. There is a strict dress code which my wife, in calf-length pants, did not meet. It appeared that about 25% of foreign female visitors (and a few males) were also pulled up. You need a shirt with sleeves, fully-covered legs and covered feet. T-shirts, see-through clothing, bare shoulders etc. are not permitted. My wife had to borrow a sarong from the booth near the entrance gate and had to leave a credit card as security. The sarong was pretty and clean but was extremely hot over other clothing as we walked the complex. There appeared to be no water for sale anywhere inside. To avoid this problem, dress conservatively and try to visit early in the morning when crowds are less. This magical place is a temple purpose-built to house a Buddha image carved from a large solid piece of green jadite. Chaophraya Chakri, who went on to become King Rama I, brought the image from Vientiane when he captured the city in 1778. It is believed the image was previous in Chiang Rai in northern Thailand and was captured from Chiang Mai by the Laos. King Rama I built the temple and enshrined the Emerald Buddha there as a symbol of Siam’s regained nationhood. The temple does not house any monks. Rather, it is more like the personal chapel of the royal family. 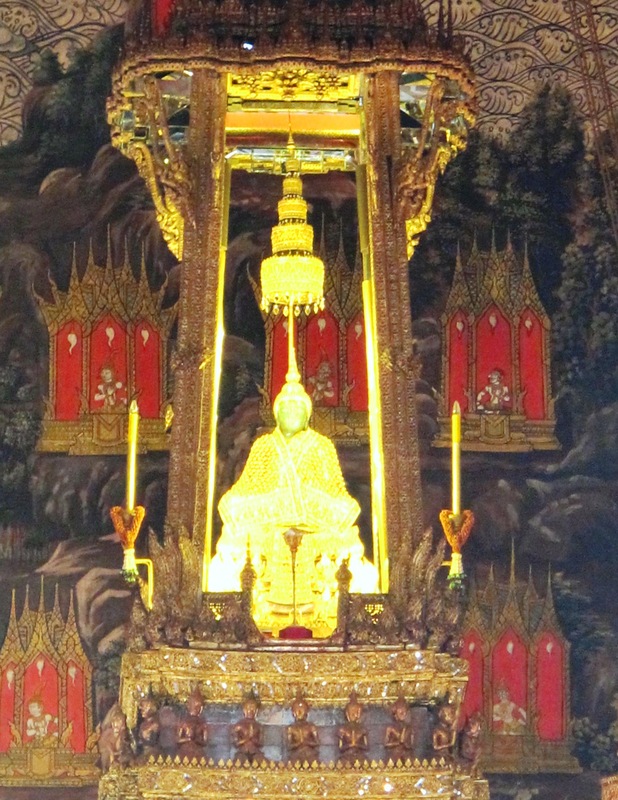 The Emerald Buddha is housed in the main building of the temple – the Ubosot. It is difficult for non-Thais to understand fully the significance of this rather small statue, kept in a glass case ten metres above the kneeling worshipers, but you can sense the power and the role that this has played through centuries of Thai history by watching the locals. Three times a year, at the beginning of the cool, hot and rainy seasons, the king changes the Emerald Buddha’s robes in a simple ceremony of great significance to the Thais. You must remove your shoes before entering this building and silence and a strict no-photograph policy applies. When you enter the temple compound on the west side, climb up to the upper terrace before proceeding around to the entrance to the ubosot. North of the ubosot is an elevated platform with three large buildings in a line. Originally, the temple’s main library, the Ho Phra Monthien Tham, was on this spot, but it burned down in a fire caused by fireworks later in the reign of King Rama I. He decided to have the Phra Mondop built on this spot. King Rama IV added two other structures to the upper terrace. He also commissioned the model of Angkor Wat. This is a truly spectacular area so allow time to see it properly. Don’t rush your visit here. You are in the most holy place in Thailand and you need time to appreciate it. Apart from that, it is just a wonderful place assaulting the senses from all sides. The entire temple is enclosed by a covered arcade, the outer wall of which is painted with elaborate scenes from the Ramakien epic. Each entrance is guarded by a pair of huge demon statues. Wat Po is located just south of the Grand Palace. It is the oldest and largest temple in Bangkok and is often called Thailand’s first university. The temple complex is so large, yet so crammed with buildings and other structures that it is initially somewhat overpowering. To help you overcome this problem there is a guide service available at the main gate. This can help you get the most from a visit. The main attraction for most visitors is the gigantic 46-metre long reclining Buddha, entirely covered in gold leaf. The huge feet are marvelously inlaid with mother-of-pearl with the 108 signs of the Buddha. Rama III is responsible for the construction of the reclining Buddha. The building housing the reclining Buddha is just barely big enough to hold the statue, which is why it is almost impossible to take any wide photographs of the whole thing. Next to the Reclining Buddha wiharn is an enclosure holding the four largest of the temple’s 95 chedis. All of the chedi at Wat Po are square, rather than the round bell shape generally preferred at the time. They are decorated with ceramic tiles and three-dimensional ceramic pieces which form intricate floral patterns. The center of the three chedi in a line is the oldest, having been built by Rama I to hold a Buddha image bought from Ayuthaya. Later, Rama III built the chedi north of this to hold the ashes of Rama II, and the one to the south to hold his own remains. The fourth chedi was built by Rama IV for unknown purposes. To get to the ubosot, the main building of the temple, you need to walk round to the south side of the cloister and enter through one of the doors on either side of the pavilion on that side. The cloister is a double-ringed affair housing nearly 400 Buddha images, with the ubosot in the middle. Among the many other features, it is fascinating to see the traditional medical practitioners who still dispense treatment daily at the wat. Also the massage school is open to the public so you experience the pleasure of this art form. Remember that the early kings regarded the temple as the primary source of public education so objects were placed in the compound to instruct people. Many of these can still be seen today. Thais can enter the complex without a fee but foreigners are charged 100 baht at booths just inside the north or south entrances. You can reach Wat Po by boat, bus or taxi. I like to take a river boat to the Tha Thien pier then walk through the market and up the short street. For more information on Bangkok see Experience Thailand an ebook available at www.amazon.com/kindle then search Len Rutledge. This entry was posted in Thailand by len. Bookmark the permalink.